A successful launch. The rockets are 20 metres long, and can fly 300 metres into the sky. If you want to see cutting edge rocket technology, head to the Japanese Space Agency’s launch site at Tanegashima. 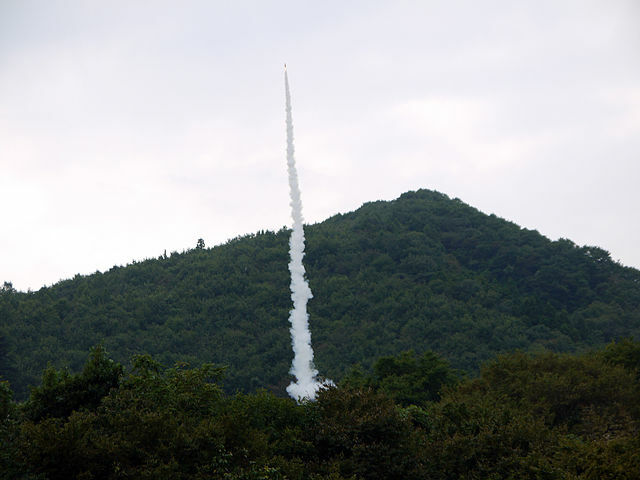 But if you’d rather see the hand-made efforts of amateur rocket-builders, Chichibu is the place to be. For hundreds of years, local farmers have been launching giant rockets as part of an annual Shinto festival. Each year, the festival takes place on the second Sunday in October, and rockets are launched all day long at 15-minute intervals. There’s a break of about an hour from 11am so that a ceremony can take place at Miku Shrine, which is about 300 metres from the launch site itself. The name of the festival means ‘dragon power’ – and the rockets are said to resemble a dragon ascending to heaven. I can’t comment on that, as I’ve yet to see a dragon in the flesh – but they are certainly very impressive. A team carefully prepares their rocket for launch. The long bamboo guide pole hangs down to the bottom of the tower. There are 27 rocket-making groups who together launch 30 rockets (a handful launch two instead of just one), and each has its own traditions and techniques that have been passed down over the generations. No one’s too clear on the origins of the festival, or how the local farmers learned to make rockets in the first place, but having had hundreds of years of practice, they seem to have got very good at it. Each rocket is about 20 metres long, and weighs up to 50kg. The motor is a hollowed-out section of a pine tree’s trunk packed with gunpowder. This is tightly bound in bamboo, and attached to a long bamboo guide pole. On the top of the rocket is placed the payload – a parachute so it can return to Earth safely, and a collection of shoimono – ornaments that are released high-above the watching crowds. Each rocket is planned very carefully, and it can take the best part of a year to go from the design stage to final completion and assembly. There is ongoing competition between the groups to try to come up with the best, most innovative and most elaborate displays. Most spectators take a picnic, some beer or sake, claim a bit of space, and just sit down to watch the extravaganza unfold. Rather than being all slick and polished, the festival has a nice amateurish feel to it. Enormous wooden rockets held together with bamboo might seem a bit dangerous, but the rocketeers are very experienced, and every rocket undergoes a safety inspection prior to launch – so I wouldn’t worry too much. Blast off! 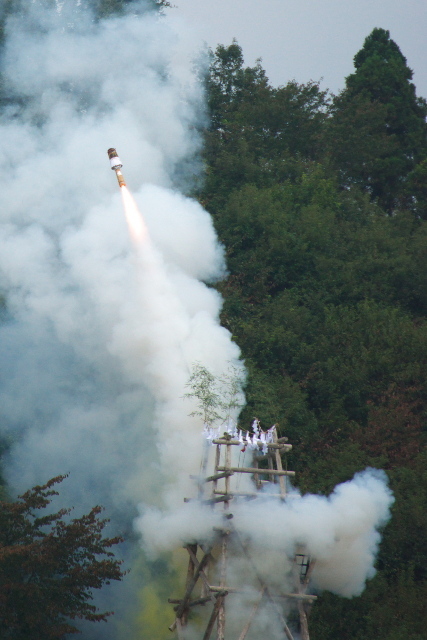 Flames jet out of the wooden rocket motor while the shoimono payload sits on top. The teams march in one-by-one, each team carrying their 20-metre long firework on their shoulders, chanting as they go. 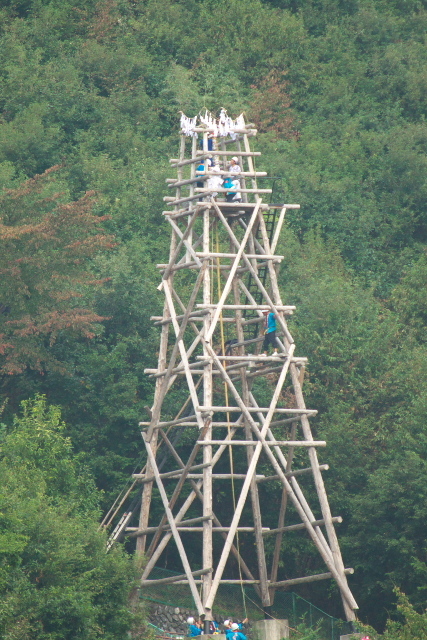 The rocket is taken to the launch scaffold up on a forested hillside a safe distance away, while nearer to the crowd other members of the team head to a stage where they announce the name of their rocket, and the sponsoring organization to which it is dedicated – such as a local business or a community organization. The rocket launches are form of prayer – intended to bring a good harvest or other good fortune – so the speeches end with a chanted invocation. A drum-roll builds up the tension, and all eyes turn towards the launch tower. These are tense moments for the rocket teams – not every rocket will launch smoothly – and there are no second chances. Some rockets veer sideways and crash into the hillside – their carefully planned performance lost amongst the trees. Others don’t even make it airborne – instead exploding on the scaffold. When the moment comes, the fuse is lit, and a thunderous roar fills the air. With luck, the rocket surges skywards to a height of some 300 metres, trailing smoke as it goes. Once it reaches its zenith, the shoimono are released and rain down from on high. The crowd reacts with cries of appreciation as the rocket’s secret is revealed – it could be brightly-decorated paper umbrellas, spinning metallic fans, clusters of fireworks, a swarm of miniature gliders, or a banner with a written message. 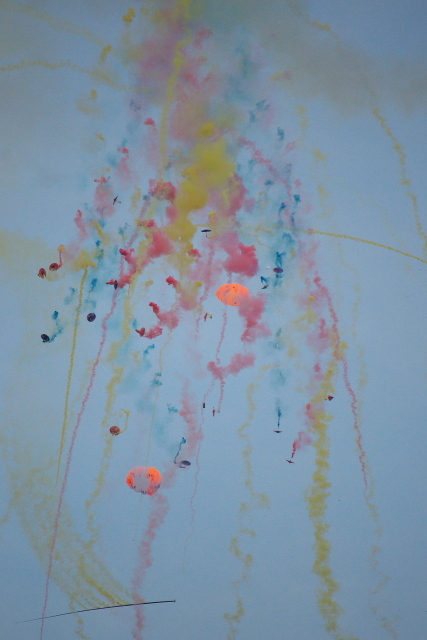 The rocket itself comes down on the biggest parachute of all, often trailing coloured smoke as it goes. The crowd responds with shouts and applause, and you can really feel the infectious excitement. Every rocket has its own unique set of shoimono, and so it’s always a surprise when they appear high in the sky. The long guide pole of the rocket itself can be seen at the bottom left of the picture, peacefully parachuting back to the ground. Anime fans might recognize the festival from the anime ‘Anohana: The Flower We Saw That Day’. Anohana is set throughout the Chichibu area, but one story has the characters building a rocket as part of the Ryusei Matsuri. If you can’t make the festival, or you want to see the rockets and shoimono close-up, there’s a small museum at the Ryusei Kaikan, which is about ten minutes walk from the festival site. It has displays of shoimono from previous years, a scale model of the launch tower, information about how the rockets are built, and plenty of merchandise from the Anohana anime. You can even watch the festival recreated on their giant TV screen – though it’s not quite the same as being there in person. The museum is open from 9:00am to 4:30pm every day except Tuesdays, and can be reached by bus from Seibu Chichibu Station. Entry is ¥300. If you’re keen on Japanese history, there’s also an exhibition about the Chichibu Rebellion – a failed peasants revolt that took place in 1884. The Ryusei Matsuri itself is free to attend. Reserved seating goes on sale in August from the official website, but as it tends to sell out almost immediately, unless you’re very organized you’ll just have to squeeze in wherever you can find space. On the day of the festival, shuttle buses operate to the Ryusei Kaikan from Seibu Chichibu Station (40 minutes) and Chichibu Railway’s Minamo Station (20 minutes), from where it’s a 10-minute walk to the festival itself. The bus timetable and the programme of rocket launches can be found on the festival website (in Japanese). Seibu Chichibu Station is 78 minutes from Ikebukuro Station in Tokyo by express reserved-seat train, or 102 minutes (and half the price) on an ordinary commuter train (change at Han-No). And finally, if you miss the Ryusei Matsuri, similar events take place at two different locations in Shizuoka, one every two years and the other annually.